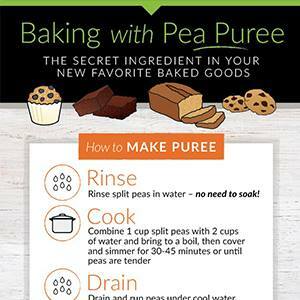 https://pulsepledge.com/pulse-tips/bake-pea-puree/ (PDF here) This concept intrigued me because split peas are so nutritious, easy to find, can be stored for long periods of time, and are very inexpensive. "Canada's large and diverse agricultural land base is ideally suited for growing a range of pulse crops including pea, lentil, bean and chickpea. More than 2.3 million hectares are seeded to pulse crops each year. Long sunny days and suitable soil conditions provide Canada with a natural production advantage, which is enhanced by the use of the latest farm management technology and research. Cold winters not only protect Canadian pulses from disease and insects, but also reduce storage quality concerns." "Pulse production has a significantly lower carbon footprint than production of animal protein. According to the Global Pulse Confederation: Producing one kilogram of legumes = 0.5 kg in Co2 equivalent, compared with 9.5 kg in Co2 equivalent for one kilogram of beef. Planting pulses leaves behind nitrogen in the soil, providing valuable nutrients to future crops. Growing them in rotation with other crops can also disrupt disease and insect cycles." I mixed 2 cups of dried split yellow peas with 4 cups of water in my Instant Pot and pressure cooked at high pressure for 10 minutes. (PS: You could use any pressure cooker, or simmer, covered, for 30 minutes on your stovetop.) The resulting soft mush just needed a few stirs to "puree", and the yield was 5 cups. I refrigerated the puree in the container for a day or so. When I removed it from the refrigerator, it had hardened considerably! (See more about this below.) I pressed the puree into silicone cupcake liners and a silicone large ice cube tray in 1/4 cup portions and froze them. Then I popped out the frozen portions, bagged them up and popped them back into the freezer for future use. So, back to the drawing board I went. I seemed to me that the puree, when cooled, had hardened to a drier state and that was probably what caused those. So I decided that I would try adding 1 T. of water to each 1/4 cup portion of the pea puree before using the next time. I had no walnuts left, so couldn't make the same recipe. I decided to veganize and de-fat a recipe out of "The New All Purpose Joy of Cooking" and see what happened. I chose their carrot muffin recipe. I substituted Aquafaba for the 2 eggs called for, and 1/4 cup pea puree with 1 T. water for the 5 T. oil. I omitted the nuts and used whole wheat pastry flour instead of white flour. I was pleased with the results-- only 134 calories each, very tasty, moist crumb, just the way I like them. To be fair, the carrots help with the moist texture, but I think I'm on the right track. I'll post any future experiments that are successful, and would love to hear from anyone out there that has had success. PS: Check out this brownie recipe using Yellow Split Pea Puree: BRYANNA'S MOIST & DELICIOUS LOW-GLYCEMIC, LOW-FAT, VEGAN BROWNIES (soy-free and gluten-free if you use GF oats; NO added oil). 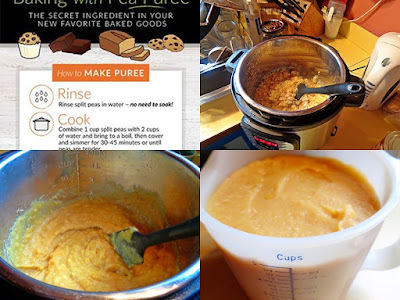 To make Yellow Split Pea Puree Fat Sub for Baking: Cook 2 cups split yellow peas (no need to soak) + 4 cups water, either 10 minutes at high pressure in the Instant Pot or pressure cooker, or 30 minutes simmered on stovetop. Mash and stir to puree. Yield: 5 cups. Freeze in 1/4 cup portions. Thaw; add 1 T. water per 1/4 cup before using in recipes in place of fat in baking, tablespoon for tablespoon. Aquafaba (chickpea cooking liquid or liquid from canned chickpeas)Egg Sub for Baking: 3 T. per egg. Optional: you can add 1/2 cup of chopped nuts or toasted sunflower seeds if you like. Preheat the oven to 400 degrees F. Prepare a 12-cup muffin pan by lining with parchment (see how to make quick liners from parchment paper) or silicone cupcake liners, or spraying with oil from a pump-sprayer, or use a light film of cake release. (See my homemade non-hydrogenated palm-oil-free version here.) I prefer to use my cake release-- I like the outside of my muffins to be a little bit crusty and I find that cupcake liners (especially the silicone ones) result in a softer crust and don't look as browned as they do when no liner is used. In a medium-sized mixing bowl, whisk together the Dry Mix ingredients. Stir in the raisins. In a smaller bowl or pitcher, whisk together the Wet Mix ingredients EXCEPT for the carrots. If you see any lumps from the pea puree, use an immersion/stick blender to briefly blend the mixture until smooth. Add the carrots to the Wet Mix and stir to mix thoroughly. Scoop the wet Mix into the Dry Mix and fold the mixtures together until the dry ingredients are thoroughly moistened-- don't over-mix. It's a fairly wet batter, BTW. Divide the mixture between the 12 muffin cups and bake for about 15 minutes. Test the center of one muffin with a toothpick. If it comes out wet, bake for a 3-5 minutes more. Cool on a rack for a few minutes before releasing the muffins from the pan. Serve hot, or cool the muffins on a rack. Nutrition (per serving): 134 calories, 4 calories from fat, less than 1g total fat, 0mg cholesterol, 195.1mg sodium, 221mg potassium, 31.5g carbohydrates, 3g fiber, 17.4g sugar, 2.8g protein, 3.9 points. UPDATE: There is a new post (Feb. 19, 2017) on making a double batch of this yogurt in the Instant pot insert, and it is a slightly streamlined recipe. I've been working on this yogurt for a few months. I wasn't having much of luck getting a tangy yogurt that was also medium-thick and creamy, like the yogurt I grew up with. I also wanted a mixture that didn't include a thickener that needed to be cooked, and I also didn't want to have to sterilize the milk first. I have finally refined the recipe to my satisfaction, and, now that I have an Instant Pot with a yogurt mode, that makes it even more convenient. It's so quick to make that I make a batch every 5 days or so, rather than making huge batches that may or may not fit into my refrigerator! Why do I make soy yogurt? I want the nutrition of soy milk and the creaminess without too much fat. The most thorough chart of the nutrients in various plant-based milks is here: http://www.onegreenplanet.org/foodandhealth/the-ultimate-guide-to-plant-based-milks/ You can see there how superior soy is in nutrition. If you are wary of soymilk, check out my page of research here: http://veganfeastkitchen.blogspot.ca/p/are-you-concerned-about-safety-ofsoy.html If you are worried about GMO beans, just buy organic soymilk-- organic products cannot contain GMO ingredients or they lose their organic labelling. The thickening ingredient is also NON-GMO, according to my research. Many people make coconut yogurt from canned coconut. However, 1 serving (1/2 cup) of that type of coconut yogurt is 240 calories compared to about 57 calories for this soy yogurt (made from full-fat soymilk). The coconut yogurt contains about 20 g fat per serving, 14 g of it saturated, compared to 2 g fat (.4 g of it saturated) in the same amount of soy yogurt. And 1/2 cup soy yogurt contains about 3.2 g protein, compared to 2 g or less with canned coconut milk. Do we really need to use a thickener? I have experimented in the past with cornstarch, tapioca starch and agar powder (each by itself, and then various mixtures of the above) as thickeners and didn't really like the consistency or mouthfeel of any of them, alone or together with another. I also didn't want to have to cook anything in the procedure. Instant ClearJel®(not regular ClearJel®, BTW) proved to be the answer to making nice creamy yogurt that will hold its' shape with any cooking. another bowl or pitcher (or even a pot) that will hold at least 6 cups-- the strainer should be able to rest on top of it without slipping. Sterilise/scald all equipment with boiling water, including the jars and the working end of the immersion blender. Pour 1 cup of the soy milk, straight out of the newly-opened carton, into the batter bowl. Heat on High in the microwave for 2 minutes. Pour in the remaining milk. Add the starter or yogurt and sprinkle on the Instant ClearJel®. Blend with the immersion/stick blender until well-blended with no perceptible lumps, but not excessively frothy. Place the strainer over the extra bowl, pot or pitcher and slowly pour the yogurt mixture into it. Press the mixture through with the back of the soup spoon if it won't go through easily. Strain all of the yogurt mixture. This will make for a very smooth yogurt and only takes a minute or two. Pour the mixture into the 5 jars, screw on the lids and place on the rack inside of the Instant Pot. Secure the lid, open the steam vent and push the Yogurt function button. Set the time. I like a fairly tangy yogurt, so I set it for 10 hours, depending on how long I've been using the starter (it gets tangier with age, and then weakens, by which time you need a new starter). You can taste it after about 8-9 hours and add time if need be. It will get a little tangier as it cools in the refrigerator. When it's done, refrigerate the jars for 12 hours before serving. About 10 years ago, I developed the original of this recipe for my now-defunct cooking newsletter The Vegan Feast Kitchen. I was going for a partially whole-grain, low-fat, moist muffin with good structure. (I don't like dry muffins.) In those days, I often used medium-firm or silken (extra-firm) tofu as an egg replacer in this type of baking, and it worked well. The other day I came across the recipe and I had all the makings. They sounded perfect for a cold winter day, along with a hot cup of tea. As I was assembling the ingredients, I wondered if I could use aquafaba instead of the tofu (my freezer is full of aquafaba ice cubes!). I had my doubts, because tofu is solid and aquafaba is liquid. But, you never know til you try, so I took the plunge and substituted aquafaba for the tofu, measure for measure, but cut the non-dairy milk down by 1/4 cup. I also decided to cut the sugar down by a third, which turned out to be a good decision. The batter was very moist, even by my standards (my muffin and cake batters tend to be more moist than traditional ones) and I was a bit worried, but there was not much I could do about it at that point, so into the oven they went. I also opted for using the two-thirds of the batter for muffins and one third for mini tea breads in little fruitcake pans, just for the heck of it. It worked! The muffins and the tea breads came out beautifully. (Note: I don't know if the batter would turn out so well in a large loaf pan.) The crumb was moist but the muffins and bread were easy to slice, and the flavor and aroma were balanced and delicious. This recipe is definitely a keeper and I'm happy to be able to use up some of my aquafaba stash in all of my old muffin recipes. Preheat the oven to 375°F. Prepare 18 muffin cups. (OR 12 muffin cups and two mini loaf pans [5.75 x 3 x 2 inches). You can use silicone cupcake liners, if you wish. I use my Homemade Cake Release to grease the muffin pans (and mini loaf pans) and don't use liners, because I like a bit of a crust on my muffins. Use a citrus zester to zest two of the mandarin oranges. Set the zest side. Peel all three of the mandarin oranges and section them. Remove any pits that might be present. Carefully cut the sections into small pieces with a sharp knife. Set aside. pieces, pecans, and cranberries and toss briefly to coat. In a blender, combine the Wet Mix ingredients until smooth, including the mandarin orange zest. Pour the Wet Mix into the Dry Mix and stir briefly-- it will still be lumpy. Don't over-stir. Scoop the batter evenly into the muffin cups (and mini loaf pans, if using). Bake for about 20 minutes for muffins and 25 minutes for mini loaf-- test for doneness with a cake tester or toothpick. Cool the pans on racks for 10-15 minutes before removing the muffins. I don't know about you, but, after all the feasting and festivities, we feel like eating pretty simple food. But, given the cold Northern wind blowing here today over the water, it's got to be solid winter food-- solid, but not stodgy. Tonight, of course, we're having my vegan version of Hoppin' John, a New Year's tradition with Southern roots (I do have ancestors who hailed from Virginia). The beans (or black-eyed peas, in this case) are for luck, along with some cooked greens for money, and some corn bread or brown rice (I haven't decided yet). But, after that, we often have winter soup meals. (I love making soups, in case you hadn't noticed!) 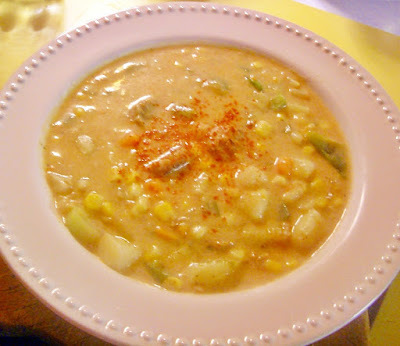 So here is a soup that I developed some years ago, but have not ever posted on this blog. It's a creamy chowder-- so warming and satisfing-- but with a few twists. I hope you enjoy it! Can you ever have enough good soup recipes? Not in my book! This recipe uses a bit of smoked salt for extra flavor. Mix together the broth, sweet potatoes, potatoes, green onions, red pepper, celery, bay leaf, and smoked salt in a medium soup pot. Bring to a boil, then reduce heat to a simmer and cook, covered, until the potatoes are just tender. Add the corn kernels and the sliced sausage and heat through. In a blender, combine the milk and tofu with the potato starch until smooth. Pour, stirring, into the hot soup. Stir until it thickens (potato starch thickens when mixed with hot liquid-- it doesn't actually have to cook). Add pepper to taste and taste for salt. Serve hot, sprinkled with the optional smoked pimenton, if you like. Nutrition (per serving): 248.2 calories; 20% calories from fat; 5.8g total fat; 0.0mg cholesterol; 586.5mg sodium; 558.1mg potassium; 36.2g carbohydrates; 6.9g fiber; 8.2g sugar; 15.8g protein; 4.6 points.